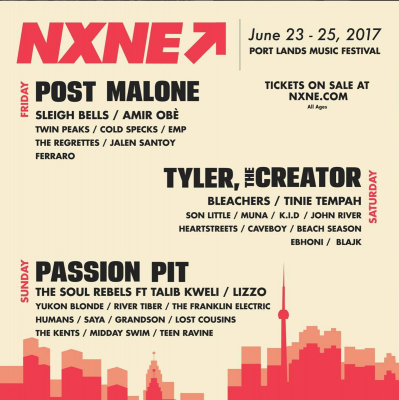 NXNE Port Lands Music Festival is just around the corner! Running June 23rd to 25th, the festival features a stacked lineup of high-profile performers including Tyler The Creator, Passion Pit, Post Malone, Tinie Tempah, Bleachers and more. But did you know that the lineup is rounded out with some incredibly talented local Toronto acts? From hiphop to indie rock performers and more, we’ve put together a list of amazing Port Lands artists hailing from the Greater Toronto Area. Don’t miss these local heroes at NXNE Port Lands! Culturally representing the face of new Toronto and based in the GTA, EMP members include Eestbound, Milly Manson and Pree. EMP caught the ear of Toronto hiphop veteran Kardinal Offishall: “When I saw them in person I knew they were everything we know and need in music today.” With a signature sound, EMP is creativity at its peak! Based out of Mississauga, this duo includes Kara Lane and Bobby Lo, high school friends who turned their relationship into ideas around cravings and desires. The band partnered with Mike Crossey, producer of The 1975 and Arctic Monkeys, who liked their song “I Wish I Was Your Cigarette.” The band just released their newest EP Poster Child. Another artist from Mississauga, John River bursted onto the music scene in 2012 with the release of his first project, The Calm. In 2015, Hope City II went viral and earned River his first MMVA nomination for hiphop video of the year. But John River is more than a rapper; he’s an artist, and his music is a movement. River Tiber, a.k.a Tommy Paxton-Beesley, mixes his love for R&B, hiphop and alternative music into even better places. His creativity shows just how his blend of R&B and bass music stands on its own. 2016 was a highlight for the artist with the release of Indigo. Born in Toronto, Canadian artist Cold Specks (Ladan Hussein), is a rare talent with an incredible depth of feeling and soul. Her 2012 debut album, ‘I Predict a Graceful Expulsion!’, is hailed as a masterful and original debut and was shortlisted for a Juno award and Polaris Prize. Cold Specks worked on Moby’s album ‘Innocents’ and was invited to play with Joni Mitchell at the singer’s 70th birthday, alongside the likes of Herbie Hancock. She’s currently in the studio completing her third album and will be hitting the road soon. Raised in Toronto, Saya splits her time between here and Los Angeles. Saya arrives onto the scene fully formed with her debut single “Wet Dreams.” A natural star, the 21-year-old singer has a great sound of fusionist pop for a fusionist pop world! Ebhoni O’Garro is a seventeen year-old who is sure to turn heads. Born and raised in Toronto, Ebhoni has a sense of focus and determination and discovered her singing talent at a young age. She’s cultivated a unique sound, mixing pop elements with experimental R&B — and it’s clear her sound can only get better from here! Though born in New Jersey, he relocated to Toronto at a young age and grew up surrounded by music. While living in LA, he dove deeply into iconic rock bands, found a small community of musicians to perform with and set his sights on creating a live show that provides a cathartic release for concert goers. His music touches on adolescence, relationships, and the insecurities and difficulties of growing up through your 20s. When asked about today’s music scene, he says: “I genuinely believe the world needs honest rock & roll, now more than ever”. Meet Toronto’s Midday Swim, whose sound is born somewhere between the endless sunny days that slowly turn into balmy July nights. The band formed less than three years ago at a lakefront cabin in the backwoods of Ontario, combining lush vocals, guitars and a driving rhythm section. Midday Swim recently dropped the music video for the album’s single ‘Hold On Tight’. Brothers Cosmo, Tally and Gianni have no memory of when they started to play together. To them, it’s always been so. Their music is 50s inspired, and yet it’s inherently modern. They clash, bang and grit it out, with a melodic tone that is reminiscent of The Beatles and The Strokes. Their debut record ‘Losing Sleep’ encompasses all those aspects and sticks in your head and it’s catchy as hell. This duo is due to release their debut album this fall. Teen Ravine is a Toronto-based group formed by Nick Rose and Dan Griffin. Referencing the soft-rock, R&B and confessional pop of artists, the duo strives to make music that is both nostalgic and modern. Hailing from Lindsay, Ontario, The Kents are a four man group with a great indie sound. Their songs tend to explore family, loss and separation from the comfort of adolescence. Their lead single, ‘The Stakes’, was featured on the Apple Music’s 2016 Rising Stars and Spotify’s Best of 2016 Viral Hits. We’re excited to see all these amazing local artists take the NXNE Port Lands stage! Catch them all with a weekend pass available at nxne.com.